I was expecting quite a bit from this book because of all the hype and general love of it throughout the blogging community and I was not disappointed. This book is fantastic. 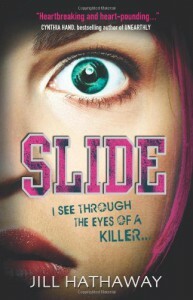 Once I started reading Slide, I couldn’t put it down and was instantly drawn into Jill Hathaway’s world. Sylvia ‘Vee’ is a narcoleptic – not only can she not control her sleep; but when her episodes happen, she ‘slides’ into someone else’s mind and see’s through their eyes. She’ll slide into her father’s mind whilst he’s in the middle of surgery, into her teachers and find out they have a drinking problem or into her sister’s mind and overhear private conversations she definitely shouldn’t be hearing. However, she’d take that any day over accidently slipping into the mind of a killer, standing over the dead body of a cheerleader - her sister’s best friend. Suddenly, another cheerleader is dead and everyone around her seems like a suspect, everyone seems like they have something to hide. Vee must try force herself through the tangled web of lies and danger to find out who the killer is before they strike again. I loved Vee’s character; I thought she was very refreshing and such a relatable person. She’s so compassionate, kind, selfless and headstrong, all of which mix together to create a character I would be more than happy to know. Vee’s an outcast at school and is constantly whispered and laughed at because of her ‘episodes’. I found it so easy to connect with her character on so many different levels; especially with her feelings of loneliness and thoughts that she has no one to talk to. 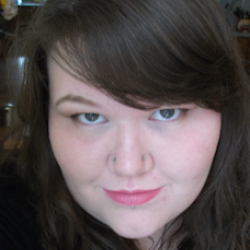 She also has very rebellious, bright-pink hair, which is pretty awesome if you ask me. Vee is only really close to one person, her best friend, Rollins, but feels they are drifting apart because of Vee not being able to tell him about her sliding. I loved Vee’s and Rollins friendship; they were on rocky waters throughout the book, however Rollins was constantly trying to be there to support her. I believe the bond they had was unbreakable and I felt like you could see their raw emotions sparking off each other. As for Zane, well, what can I say? He’s a sweet, vulnerable, gorgeous guy with a beautiful personality to match. Whenever I was reading scenes with Vee and Zane together, I felt like I should be wearing a cheerleading uniform, waving Pom Poms and yelling ‘GO! GO! GO!’ Zane was a wonderful character and I loved watching his and Vee’s relationship grow; from a new-found friendship to something sweet and sensual. Moving on; I thought that Vee’s relationships with her father and sister, Mattie were really well developed and incredibly well thought through. Vee’s father is a surgeon, and ever since the death of his wife, has been very distant, staying at work late and barely being around his remaining family. Because of this, Vee has had to step up and take responsibility for her younger sister, and basically become a second parent to her. Even so, Jill wrote about this is a way that makes you understand and feel compassion towards the characters; and create a need to dig deeper into the story to see what’s between the lines. The concept for this book is incredibly unique and whilst reading it, I was constantly suspicious of all the characters. Slide keeps you guessing and wondering at every turn and doubting any prior ideas you may have had whilst reading it. This novel also tackles more serious and emotional affairs such as; suicide, bullying and adultery in a careful and tactful manner. I felt like I could feel the heartache of the characters and the raw emotion that was occurring, but was unable to help ease the pain; which made the book even more incredible. There are so many more fantastic things I could say about this novel, but I don’t want to ramble on for too long. So I’m just going to say this; if you’re a big fan of thriller mysteries that keep you wanting to turn the page, this book is definitely the one for you! I believe that this book would have done better as a standalone novel; however, I am very excited to see what Jill Hathaway does with its sequel. I also believe it well and truly earned its 5/5 rating I gave and it deserves nothing less.